HURRY over to get this Whipple Deluxe Set for ONLY $7.99 (Retail $29.95)! 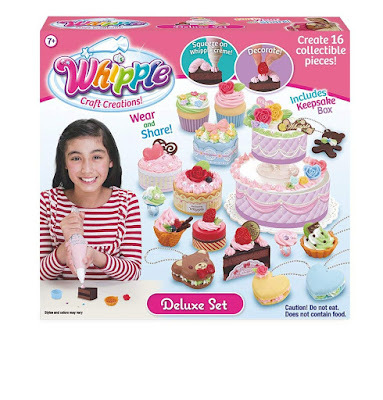 Whipple is a craft toy collectible that features special clay crème and icing pens that can be molded into beautiful keepsake designs from cupcakes to donuts, cookies and more! The Deluxe Set is a set for a great group activity as it includes two crème bags (pink and swirled mint/white) and a keepsake cake box! With this set, you can decorate a variety of cakes, chocolate, tarts, macaroons and other fantasy treats! Includes mint/white créme, pink créme, fruit, 2 rings, 5 key chains, cake keepsake box, rhinestones, beads, instructions and other accessories.